Do you have a physical limitation that makes it difficult to use the stairs or a bathroom in a typical single family home? These difficulties can jeopardize your sense of confidence and even cause you to give up your independence. My architecture firm, DRF DESIGN, is experiencing increased demand for universal design features in the home. Universally designed homes are not just for aging adults, or those with disabilities, but for all possible users of the home. 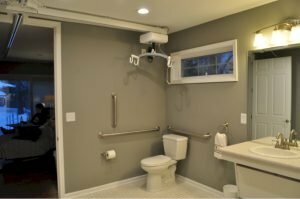 Many able bodied adults are starting to incorporate some features of universal design in their new home or in an addition/renovation to their existing home. The typical single family home presents several potential challenges for those with physical limitations. The most obvious problem is getting into and out of the house. Older homes may have six or more exterior steps. Even most new homes have at least three steps. Often, it is the height of each step that presents a challenge. Commonly, handrails are absent or improperly designed at interior and exterior stairs. How many times have you heard of an aging adult who fell on their exterior stairs? How many times does that type of accident result in deteriorating health? A home without a full bath or a bedroom on the first floor has obvious limitations for aging adults and those with disabilities. Even ranch style homes present challenges. If a full bath is located on the first floor, it typically is a narrow space with a narrow door and contains a tripping hazard at the tub. The basement stairs present another tripping hazard. The distance from one step to the next is often beyond the comfort level for both children and adults. Sufficient handrails and guardrails at basement stairs are commonly absent. Finally, the narrow doors and wall openings found in older homes can prevent a wheelchair user from getting from one space to another. If you plan to build a new home or renovate/expand an existing home, consider the following design options in your home. Create at least one entrance to the home that does not require any steps. An architect like myself can show you several ways this can be done. The length of ramps can be kept to a minimum by keeping the main floor close to grade. Where you do have steps inside or outside the house, keep the vertical rise between steps no greater than 7″ (the NYS Residential Building Code allows up to 8-1/4″). Provide handrails of the proper diameter on both sides of the stair even though the code only requires handrails on one side. Careful consideration should be given to the bathroom. I recommend that at least one inclusive full bath be located on the first floor of each new home. The bathroom door should be 36″ wide. The sink should have a clear space under it or a removable cabinet. 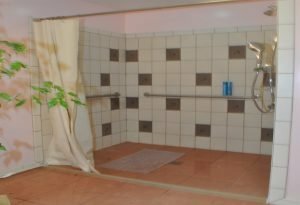 A roll-in shower or walk-in tub (with water seal door) should be considered. A collapsible rubber threshold at the shower will keep the bath floor dry. Designing for a wheelchair user in the bathroom requires an experienced designer with great attention to detail. Keep in mind wheelchair users represent all age groups and vary in their abilities and range of motions. The location of the toilet, the space clearances around it, grab bar size and positioning should all be illustrated on the construction documents. An inclusively designed full bath can be accomplished in less space than many master bathrooms I’ve seen. One new innovation that increases independence in the bathroom is a washlet, which is an electric toilet seat that can convert an existing or new conventional toilet to a bidet. It has a warm water spray that provides washing and drying without the use of toilet paper. Washlets eliminate the use of toilet paper and conserve water. Open floor plans are easy to achieve when designing and building a new home. Benefits of the open plan include better views, mobility and access. In older homes, rooms tend to be more segregated, with narrow door/wall openings and small windows. These existing conditions, however, can be improved upon. I have designed several, natural-light filled additions that transform existing spaces by creating a large opening between the two. Avoid barriers such as sunken family rooms. These rooms are often a tripping/falling hazard even for able bodied people. If you plan to build a 2-story home, consider a first floor bedroom. Make sure the designer spends time understanding the physical limitations of the person using the space. I am currently designing a Master Bed Suite that will allow a paraplegic to independently transport himself from his bed to his bathroom without getting into his wheelchair. A residential elevator will transport him, in his wheelchair, to the finished basement level where both physical fitness and entertainment rooms will be located. There are many more universal design solutions available to choose from. I encourage you to accept the need to plan for aging and embrace the concept of universal design. An Architect like myself can design and specify these features so that your builder can include them in the construction cost and build them properly. It is a rewarding process to design environments that allow people of all ages and abilities to experience increased control and comfort. David Fleming, of DRF DESIGN (716-507-4339) is a Registered Architect in New York and Virginia, and a member of NCARB.